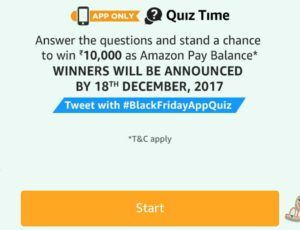 Amazon Black Friday Quiz – Answer 6 simple questions and win Rs 10000 pay balance. Black Friday Sale is the biggest shopping event in USA and now Amazon will bring the sale from the international market to India too through Amazon Global Store. In order to promote the sale, Amazon has come up with Black Friday Quiz Time in which you need to answer 6 simple questions and if you are lucky, you will get Rs 10,000 amazon pay balance for absolutely free. For your ease and convenience, we have also added all the answers below. Check and participate now. A total of 20 winners will be announced for this contest that is being held today i.e. 23rd November. Do not miss to subscribe to our Whatsapp alerts to get benefits of all best loots. 0.1 Do not miss to subscribe to our Whatsapp alerts to get benefits of all best loots. 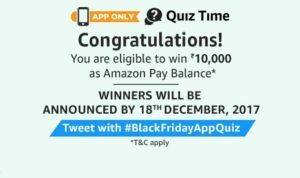 1 How to win Rs 10,000 balance from Amazon in Black Friday Quiz? 1.1 Q1) Which of these Amazon.in offerings help you buy authentic imported products from international brands across the world? 1.2 Q2) How can you identify products from Amazon Global Store distinctly while browsing through Amazon.in site? 1.3 Q3) Which of these is NOT a benefit of shopping from Amazon Global Store? 1.4 Q4) Which of these is one of the biggest sale events of the year in USA? 1.5 Q5) This year, Amazon Global Store will feature deals from Black Friday, where customers from India have access to discounts on international brands, directly from Amazon USA? 1.6 Q6) When does the Black Friday Sale 2017 start on Amazon India? How to win Rs 10,000 balance from Amazon in Black Friday Quiz? 2. Open the app and you will see a banner about the Amazon Black Friday Quiz Time contest. Click on it. 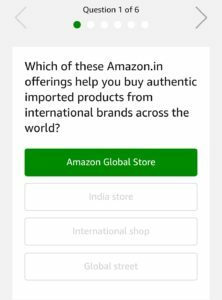 Q1) Which of these Amazon.in offerings help you buy authentic imported products from international brands across the world? Q2) How can you identify products from Amazon Global Store distinctly while browsing through Amazon.in site? Q3) Which of these is NOT a benefit of shopping from Amazon Global Store? Q4) Which of these is one of the biggest sale events of the year in USA? Q5) This year, Amazon Global Store will feature deals from Black Friday, where customers from India have access to discounts on international brands, directly from Amazon USA? Q6) When does the Black Friday Sale 2017 start on Amazon India? A user can participate by navigating to the page where 6 (five) questions will be posted during the entire Contest Period. On answering all the quiz questions correctly, the user will be entitled to a lucky draw which will be carried out amongst participants who have answered that particular question correctly. The declared winner(s) will be eligible for winning Rs 10000 amazon pay balance as a prize. Is all contest are real or no koi v jeeta hai ki nhi bro avi tak ke quiz me bro….